Get on with the newest trend! Purchase 24 bands and show your support for the American Cancer Society. The bands come in 6 different styles and shapes. 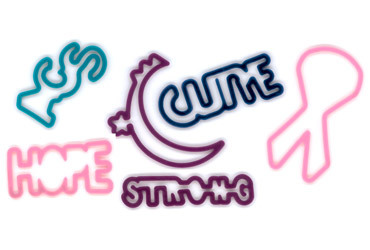 Pink ribbon, STRONG, HOPE, CURE, ACS and Moon and Stars -- the symbol of Relay For Life! You get 4 of each. For more information about breast cancer awareness, or to find American Cancer Society events in your area, please visit www.cancer.org. Be one of the first to show your support.